Red Bull Racing will switch from Ferrari to Renault engines for next year's Formula One season. 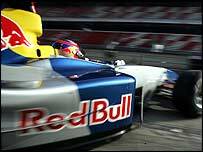 Red Bull, who finished seventh in the constructors championships last season, will now add a new engine to Adrian Newey's eagerly-anticipated 2007 car. Red Bull's sister team Scuderia Toro Rosso are also swapping their Cosworth engines for Ferrari power plants. Ferrari said the final year of the deal with Red Bull Racing was ended by mutual consent. The Italian constructors revealed it had agreed to a two-year deal with Toro Rosso, with an option for another year. The deal will see Ferrari reunited with Gerhard Berger, their former driver who co-owns Toro Rosso along with Red Bull owner Dietrich Mateschitz. "We are pleased to be embarking on a new long-term relationship with Scuderia Toro Rosso," said Ferrari chief executive Jean Todt. "It will allow us to strengthen our ties with the world of Italian motor sport and also to work with a team run by Gerhard Berger, our former driver and friend of Ferrari."